The Ion Age Blog: 15mm Ion Age Universe Characters by Dave Foley range begins with two packs released! 15mm Ion Age Universe Characters by Dave Foley range begins with two packs released! Our last releases this month see The Ion Age begins the 15mm Ion Age Universe Characters range with the first two packs of five poses released. Sculpted by Dave Foley and now on their own page of the website. If you are new to this idea please read THIS ARTICLE on our blog. We will be adding a new pack every month and it is my own and Mr Foley's intention to create a 15mm scale figure range that will allow you to get the 'people' of your wargaming on your table regardless of your setting. Its not all about the armies now is it. Go HERE or read on! 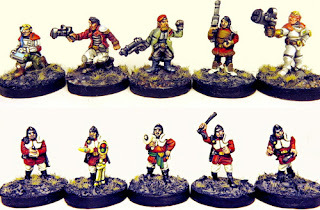 The first pack of 15mm characters in the Ion Age Universe range at The Ion Age. Precinct Adventurers are the kind of fellows you need in a scrap or to carry out some dangerous work in a place where the law is a little loose. Sculpted by Dave Foley this pack contains five different 15mm scale white metal miniatures in the following poses. Male adventurer kneeling with a data slab and connected viewer, a hansom male adventurer advancing aiming a Minstrel Taser pistol, male adventurer in long coat signalling a halt holding a Tumbler SMG, male adventurer wearing parts of Aketon armour and at guard pose with a Moth Rifle. Lastly a male adventurer in out moded Alwite armour bandaged head and Minstrel Taser. These miniatures are great for any science fiction or suitable genre of wargaming in 15mm scale when you want something other than warfare or soldiers on your table. As always this code can be bought as a pack or as single miniatures or select the three packs and save 10% options from the drop down menu on the page. Go HERE. Price 2.50GBP per pack. 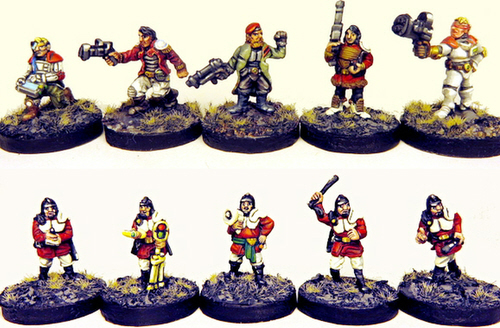 The second pack of 15mm characters in the Ion Age Universe range. Precinct Police are the local law enforcement on the worlds and colonies of the civilised Prydian Precinct who try to maintain order without the use of deadly force if possinble. A first line of law and order. Sculpted by Dave Foley this pack contains five different 15mm scale white metal miniatures in the following poses. All are wearing light armour plates, a helmet and a wet weather cape. Male officer holding a control box for directing city services or droids, carrying portable signs and signal equipment, male officer with public address horn, officer with stun baton raised to strike and lastly running with stun baton. These miniatures are great for any science fiction or suitable genre of wargaming in 15mm scale when you want something other than warfare or soldiers on your table. As always this code can be bought as a pack or as single miniatures or select the three packs and save 10% options from the drop down menu on the page. Go HERE. Price 2.50GBP per pack. The two new packs in a new range by Dave Foley (welcome Dave!) are our last releases for November 2015. Coming after ten new Taranis main battle tanks you would think that we would have nothing more to say but oh no! Sam Croes was kind enough to allow me to photograph his Castella Marcher Barony knights and Taranis APC and this is on our blog with excellent pictures and a Castellan crest too. Go HERE. The month will end with The Ion Age taking part in the awesome Black Friday Weekend that also takes the Friday to the Monday alongside our sister brands Alternative Armies and 15mm.co.uk. Next week we can tell you the offer but it is an excellent one and something we do not normally do so well worth thinking about for your late month orders. This month our free miniature in every order is IMP27 Florian Pumpkin Spore. For the whole of November this spooky 15mm miniature is automatically put into every order at the rate of one per order regardless of order value. It can also be bought in any amount on the monthly IMP page of the website for this month only too before being withdrawn on the first of next month. The Florians are an enemy of all life on a planet that is not of their origin. Vast seed pods from the void of space take root on a world before the Florian Incursion begins. Growing at an exponential rate and re-making existing plants and animals into their own image the Florians spread like a carpet across a planet and take it for their own. At the limits of the Prydian Precinct they are as alien as life comes! The miniature is one piece in white metal and stands approx 10mm tall. A great character and start to the Florians. Of course you earn reward points on all orders too through your account learn more about that HERE. We realise that some of you may wish to purchase the currently free miniature to get multiples of it without placing a lot of orders so you can do just that. Visit this page on the website for the miniature at a fair price for a special miniature. There is a growing page on the Ion Age website where the current and all former IMP series free miniatures are shown so that you can see what came before. Enjoy and go HERE.